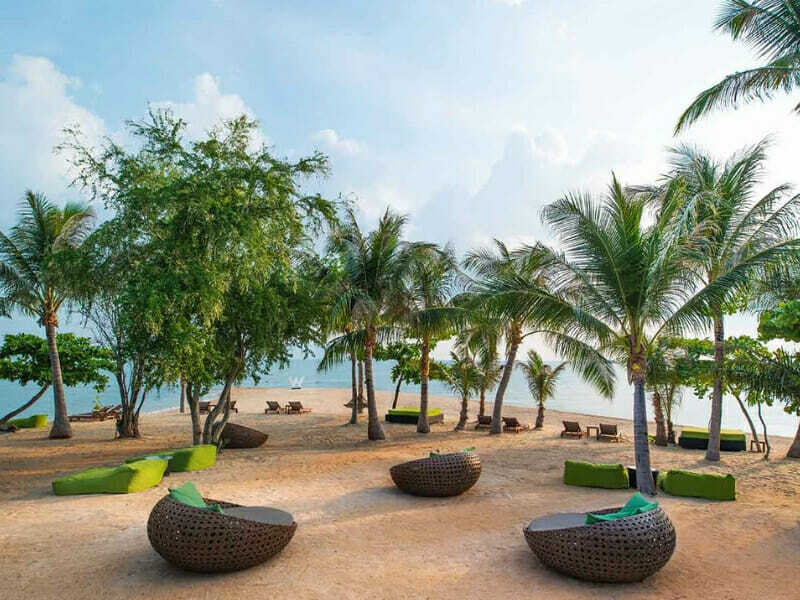 Sitting on the picturesque white sandy beach in northern Koh Samui, this is a luxury resort that has been designed in a lively contemporary style complimenting the friendly and fun vibe of its island paradise surrounds. This resort is the perfect destination for those seeking an absolute beachfront location with infinite things to do, private villas to indulge and exquisite cuisine to relish. 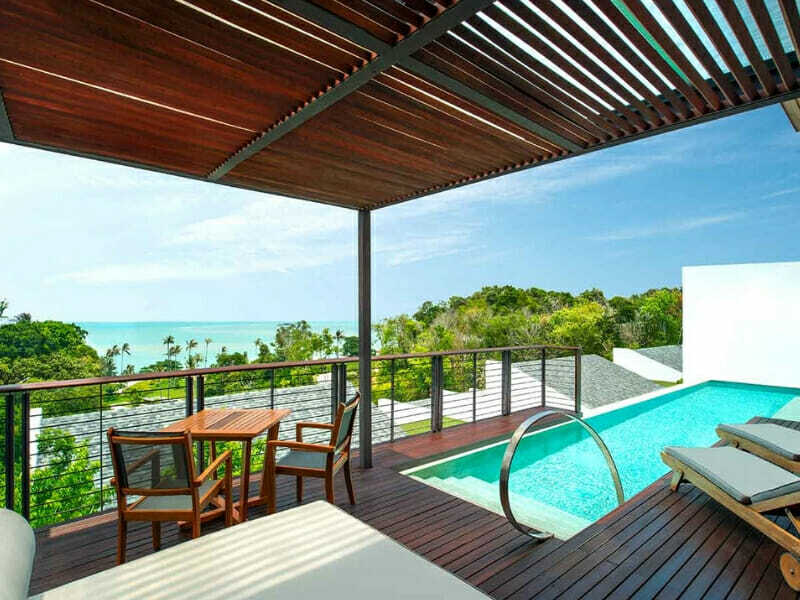 Add in the beautiful villas and amazing facilities here and this is a Koh Samui getaway you’ll remember forever. With 74 well-appointed villas in a variety of sizes and configurations, there is something to suit every traveller here. The villas have a signature contemporary style that subtly reflects that coastal location and strives to create spaces of complete luxury. Each villa has a private pool and wooden deck – ideal for unwinding and enjoying the tranquil tropical weather that is found here all year round. Unique floating lounges and beds, bright coloured spaces and modern design are just the beginning at this 5-star beachfront resort. When you want to enjoy the beach, there are hammocks, sun beds and chaise lounges to be found under the shady palm trees, plus there are plenty of beach and water activities to try such as stand-up paddle boards and kite surfing. With 6 restaurants and bars to choose from, you always have delicious food close by. From gourmet dining to modern Japanese and casual beach grill, there is a myriad of dining and entertainment options without ever leaving the resort. When you’re ready to be spoilt, the Away Spa is a peaceful retreat where you can indulge in one of the luxurious massages or health treatments on offer. 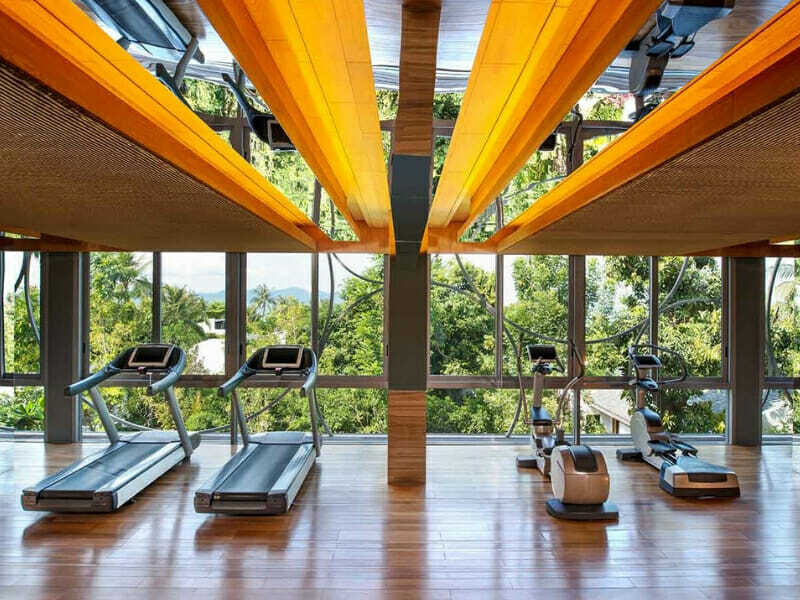 If a workout is important to you, FIT Gym is available to guests 24/7 with a range of cardio equipment and weight machines, and offers daily fitness classes led by industry professionals. Why Go to W Retreat Koh Samui? Those seeking luxury will adore W Koh Samui’s ultimate beachfront location, tranquil day spa and stunning, coastal-style villas boasting private pools. Sun-lovers can delight in hours spent relaxing on plush day beds floating over the sprawling pool and adventurers will delight in the myriad of water sports offered on the resort’s doorstep. W Koh Samui impresses all. Plush King bedding, serene garden views and an inviting private pool is just the beginning in your Jungle Oasis. Floor-to-ceiling glass opens up the space and amenities such as air-conditioning, a flat-screen TV, minibar and Wi-Fi ensure ultimate comfort and ease. This large contemporary villa is clean and modern and feels like you’re staying in a designer home. It has been styled with light wall colours and the generous use of natural timber to create an atmosphere that is unmistakably coastal, but still has an enjoyable warmth. You have your very own private pool surrounded by a huge wooden deck with an outdoor dining setting, sun lounges and a day bed. The beautiful landscaped garden gives you privacy and creates a feeling of seclusion. The villa is a massive 223sq. metres in size and has either a King or Twin bed and sleeps 2 guests. Take a break from the tropical warmth with air-conditioning and relax in front of the 46-inch TV with DVD player and satellite channels. This villa has the best views in the resort, with a beach vista that is impossible not to love. The villa itself has been styled in the resort’s signature contemporary design and is a stunning space to enjoy on your holiday. You have your own pool that is completely private and a great spot to soak up some warm Thai sunshine. The villa has a King-size bed and is a spacious 163sq. metres. The floor-to-ceiling doors and windows create a feeling of openness and allow the abundant natural light to drift through. The villa is air-conditioned, has a 46-inch TV with DVD player and satellite channels, a minibar and Wi-Fi. This villa is just steps away from the sand and is the ultimate in beachfront accommodation. If you want a change from the gentle ocean water, you have a private pool that is surrounded by landscaped gardens and an expansive deck with sun lounges, a day bed and outdoor dining. The villa has been designed in a contemporary style, with thoughtful modern furniture, natural timber finishes and splashes of colourful artwork. With 223sq. metres of space, this villa feels open and luxurious. You have a King-size bed, a 46-inch TV with satellite channels and DVD player, minibar and climate-controlled air-conditioning for total ease. 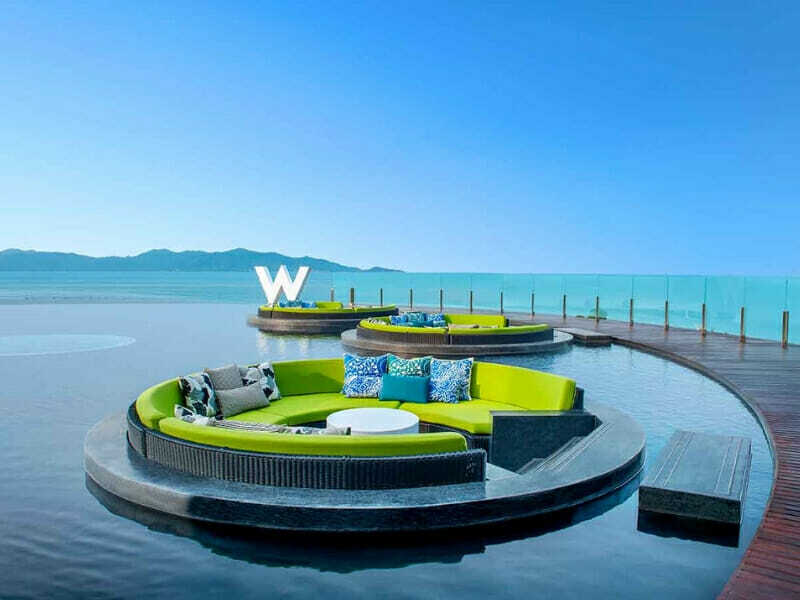 W Koh Samui is a tropical oasis set on azure waters of the Gulf of Thailand. Although located on the north shore’s Maenam Beach, this resort is still in close proximity to the vibrant village. Guests are able to access the resort in just 15-minutes from the Koh Samui International Airport (USM). Exploring pristine beaches and turquoise waters are must-dos in Thailand and you can do both right of the resort’s doorstep! In Koh Samui, deep-sea fishing adventures, snorkeling and diving are among the best in the country. On land, get a taste of authentic culture as you witness front-row views of the Big Buddha statue and imposing temples. Rainforest experiences are second-to-none with jungle quad biking, cable rides and waterfall hikes on offer. For a change of pace, hit the Chaweng Strip for epic bars and clubs or head into the village to admire handcrafted goods. You will never run out of things to see and do when you stay at W Koh Samui.